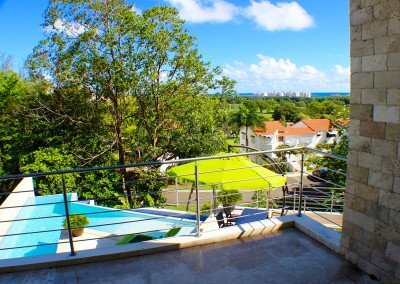 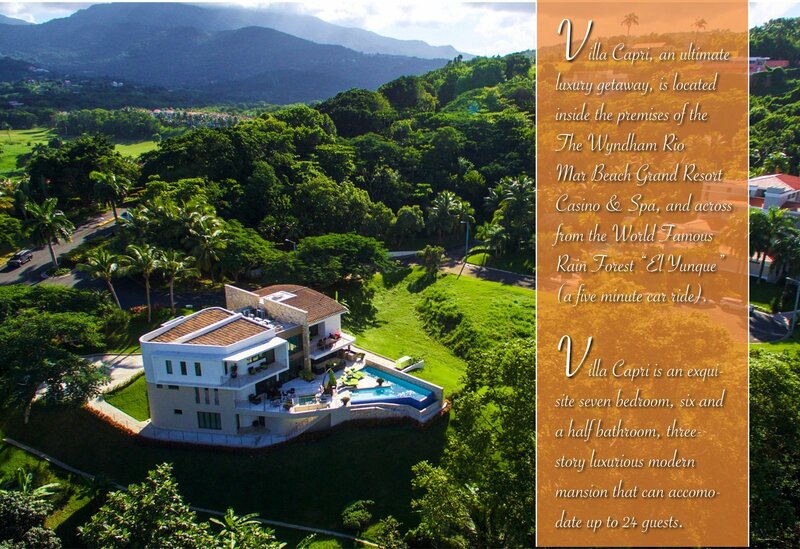 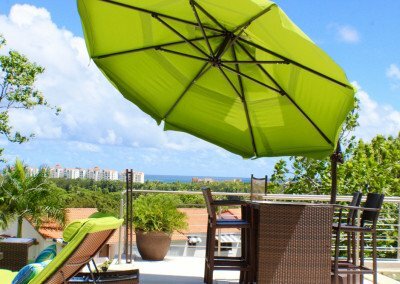 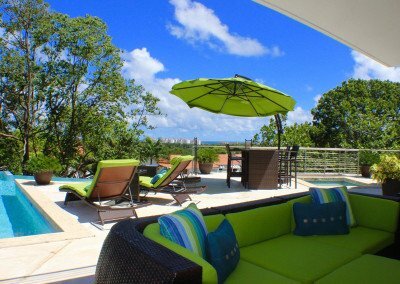 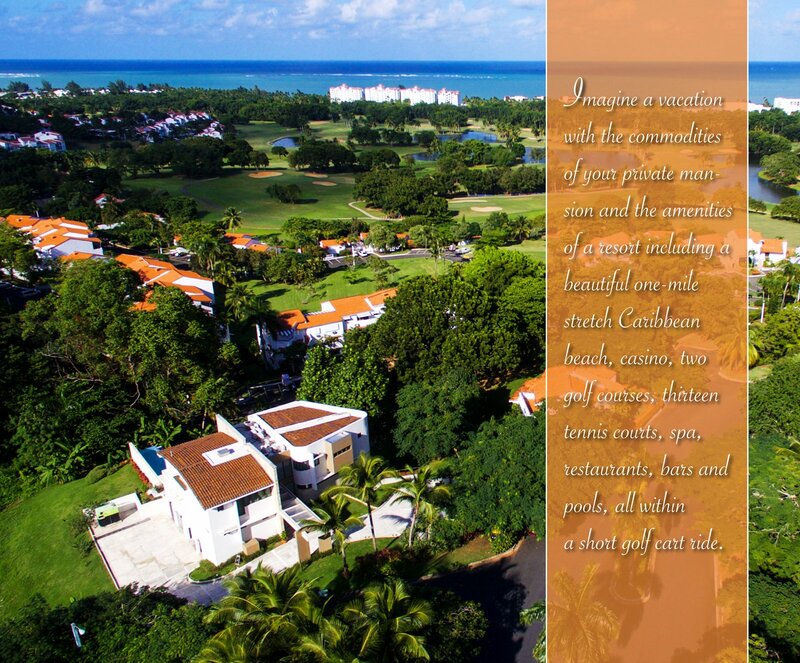 Villa Capri, an ultimate luxury getaway is located inside The Wyndham Grand Resort Casino & Spa, across from the World Famous Mountain Rain Forest “El Yunque” ( a five minute car ride). 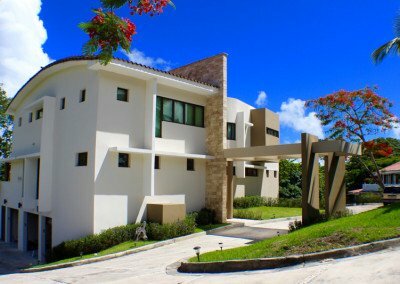 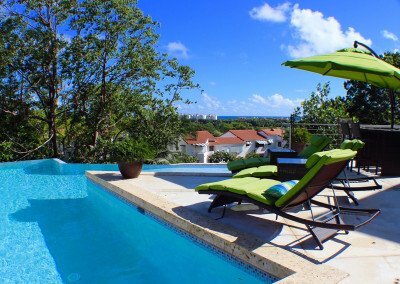 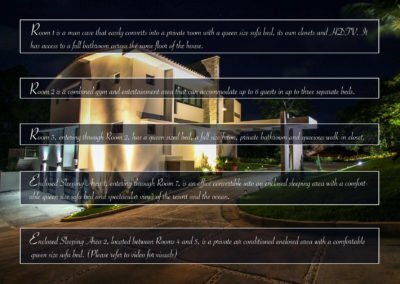 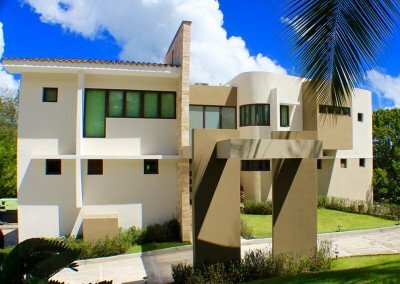 Villa Capri is an exquisite six-bedroom (plus two additional sleeping areas), six-and-a-half bathroom three-story Modern Villa that accommodates eighteen comfortably or up to twenty-one total. 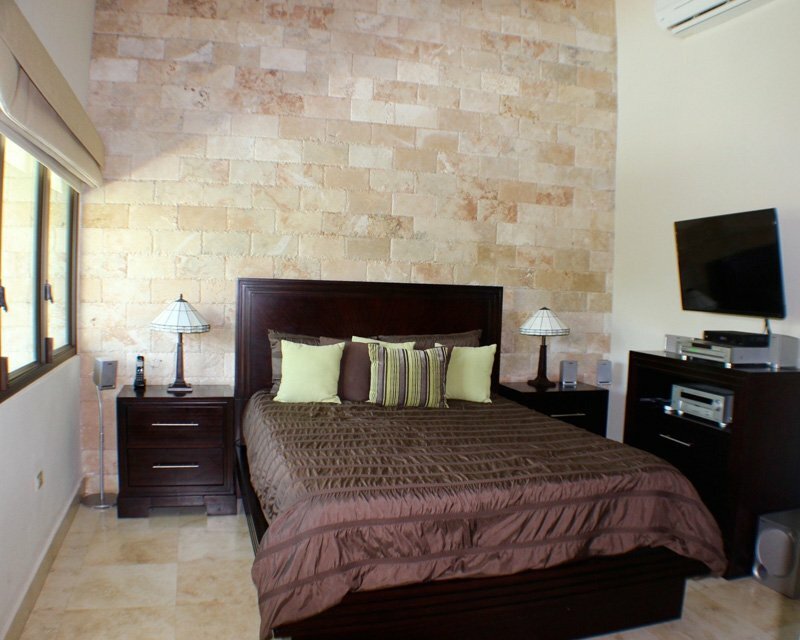 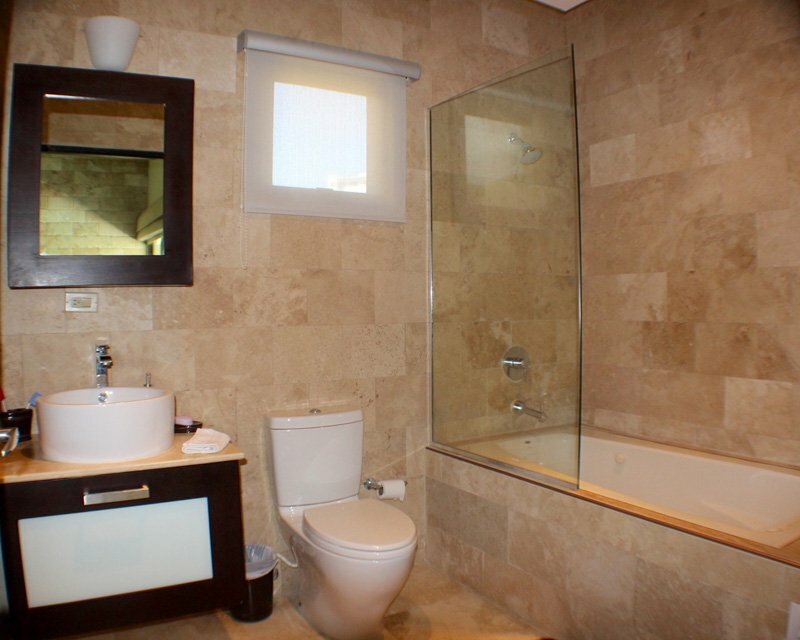 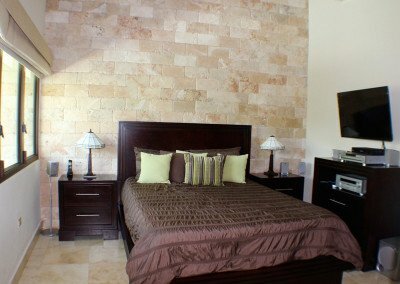 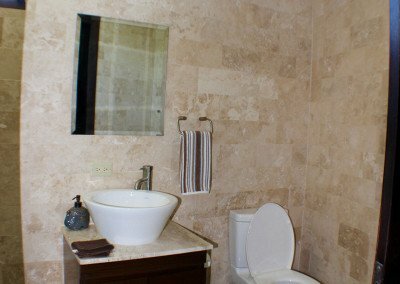 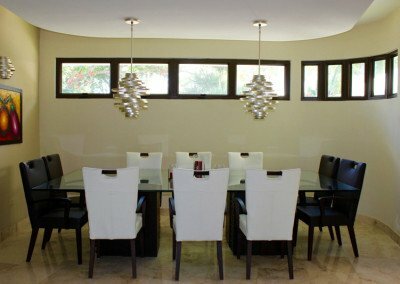 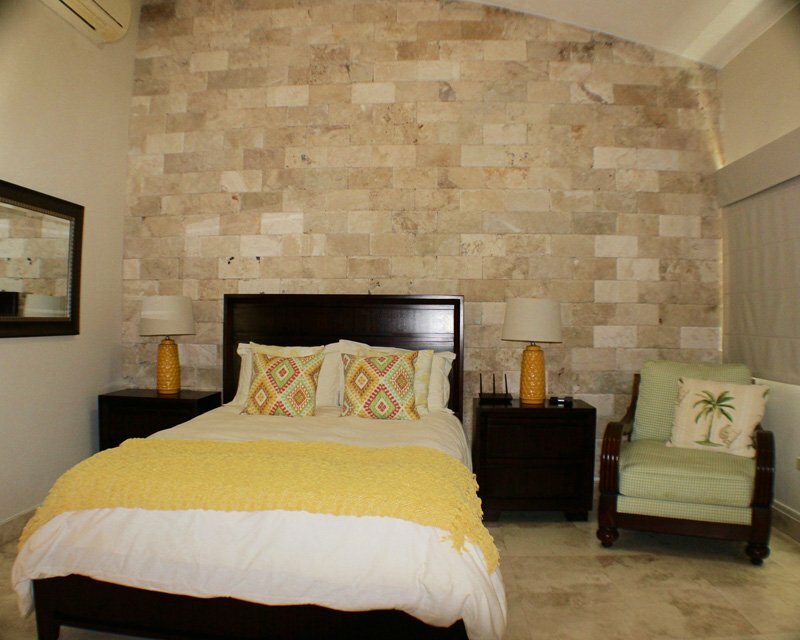 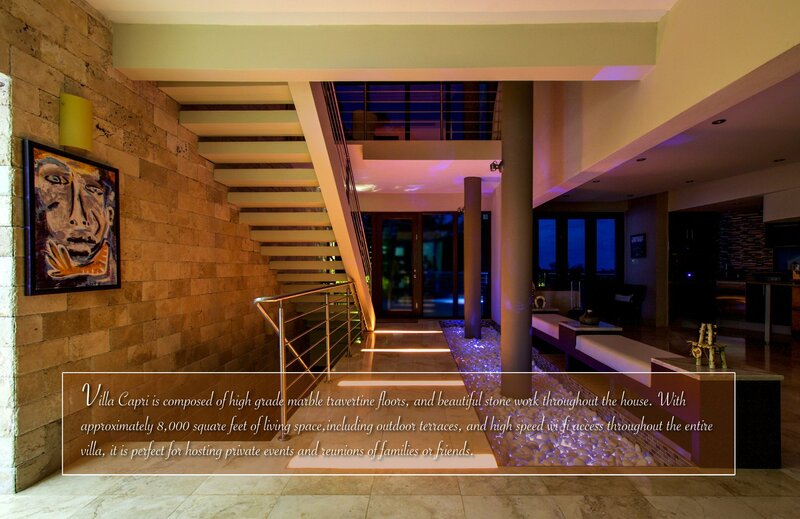 It has ten televisions, high-grade marble travertine floors, and beautiful stonework throughout the Villa. 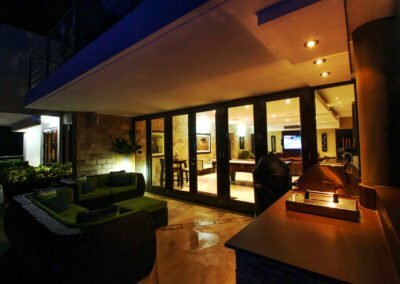 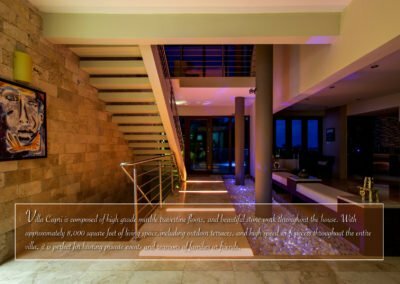 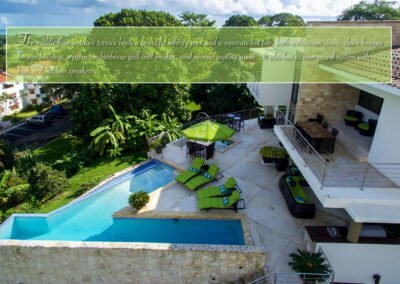 The house is approximately 8,000 square feet (including the outdoor terraces) and features high-speed wifi throughout (up to 30mbps). 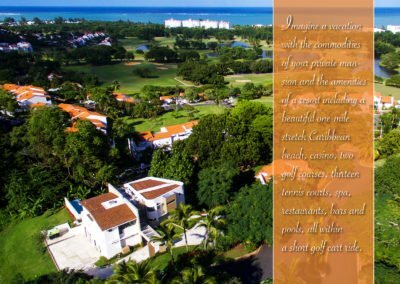 Imagine a vacation with the commodities of a private large house with the amenities of a Resort; Casino, 2 Golf courses, tennis courts, Spa, restaurants, bars, beach & pools driving around on golf carts. 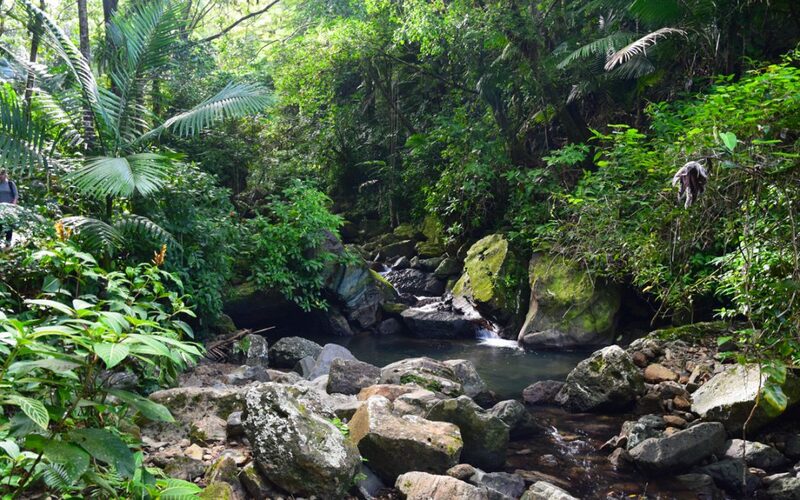 Come and listen to the magical sounds of the Puerto Rican Coqui frog fill the night with this special serenade unique to Puerto Rico! 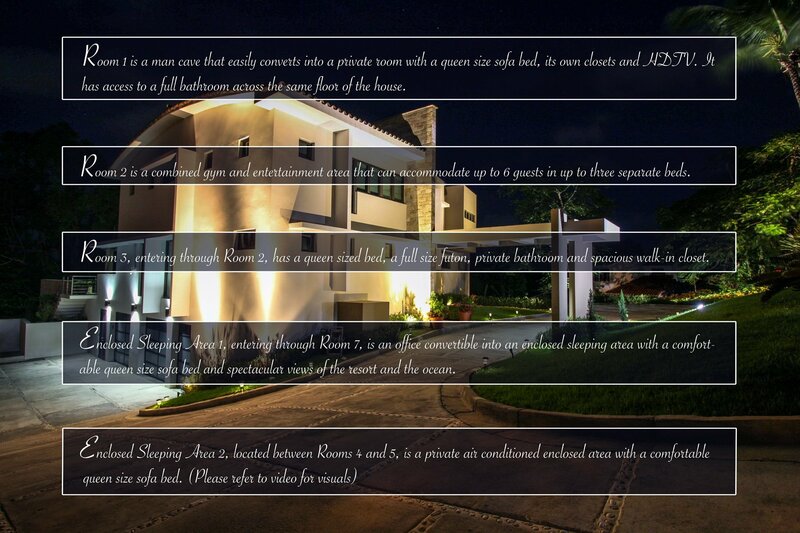 *There is a two night minimum stay. 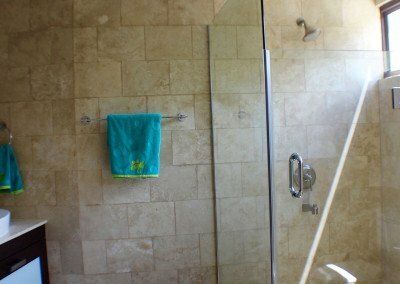 Price does not include 7% taxes and $800 check-out cleaning fee. 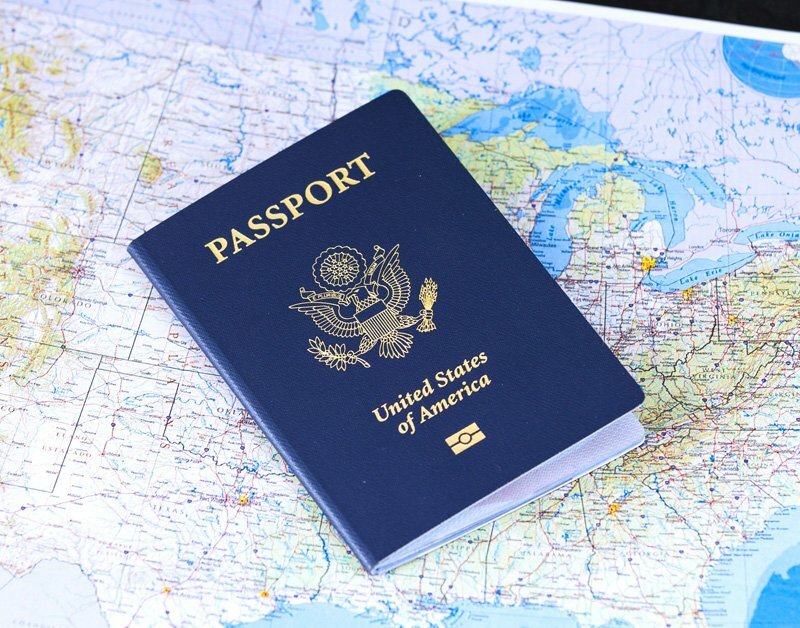 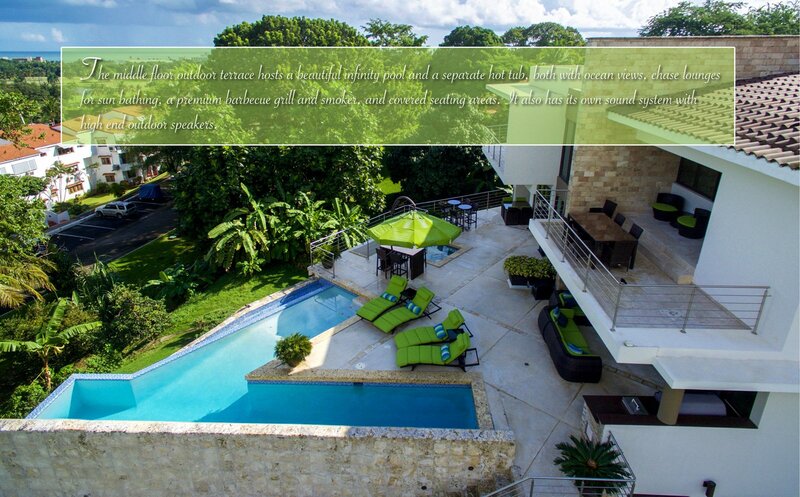 Premium rates apply during holidays. 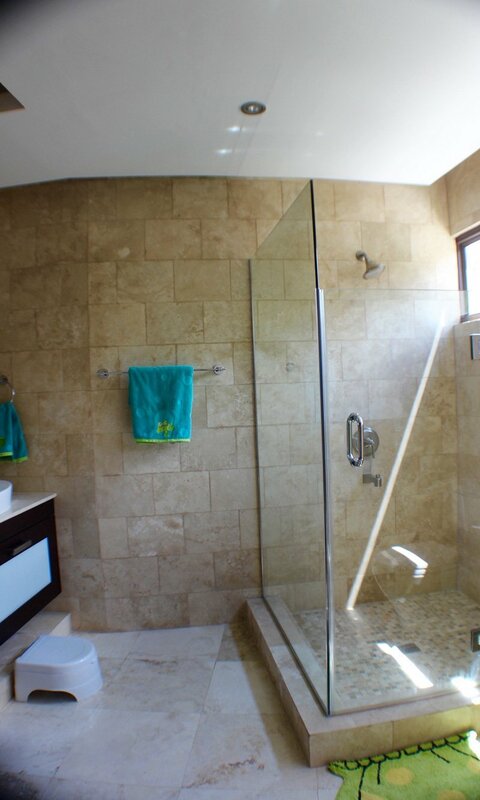 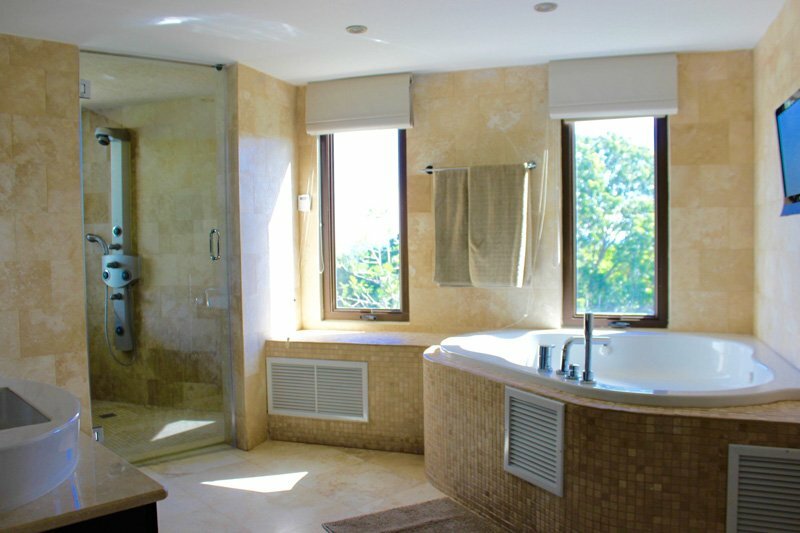 There are 4 bedrooms with en-suite bathrooms, including the master-suite. 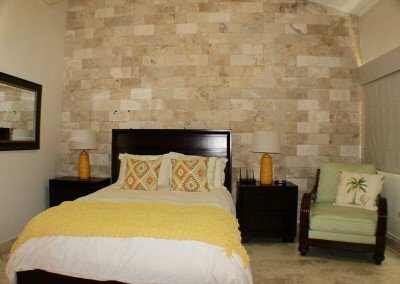 The master-suite has a king size bed, a balcony overlooking the ocean and a large bathroom with a jacuzzi tub and a steam room. 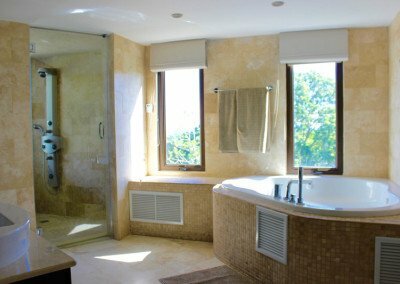 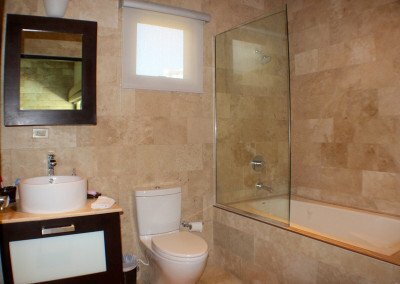 The other 3 bedrooms have queen size beds and en-suite bathrooms, one of them including a jacuzzi tub. 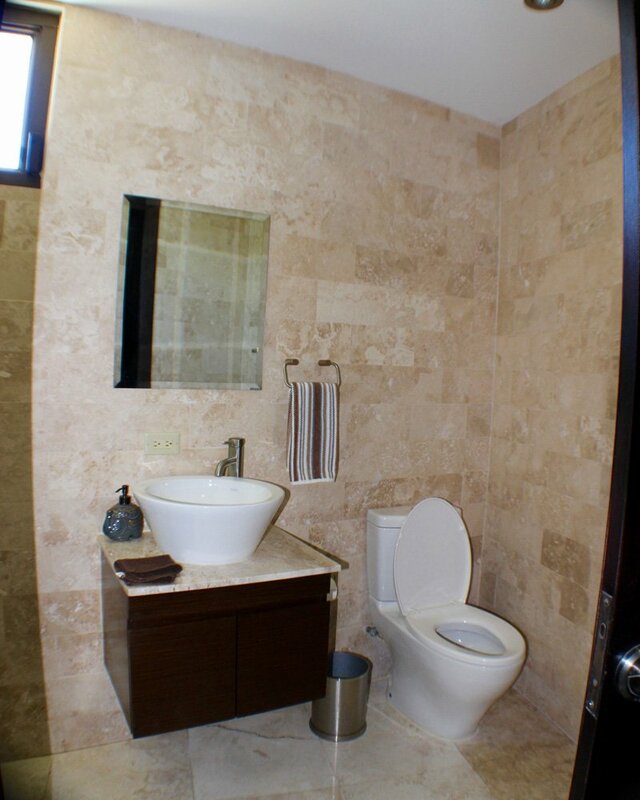 All of the bathrooms have marble counter tops. 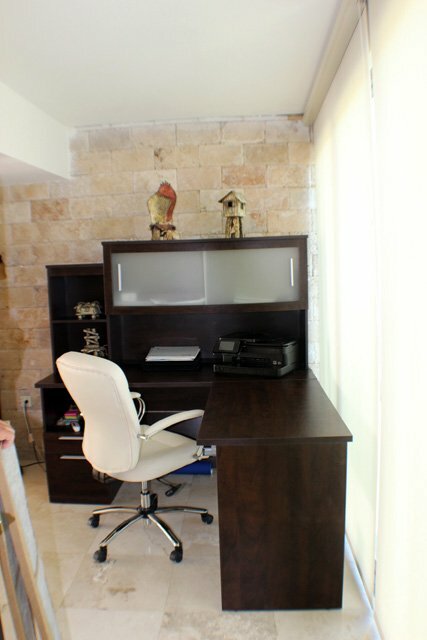 There is also an office with a full-sized futon, a reading area, and a fully-equipped laundry room. 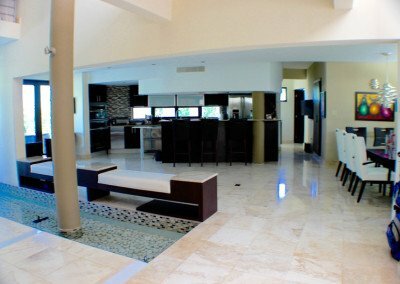 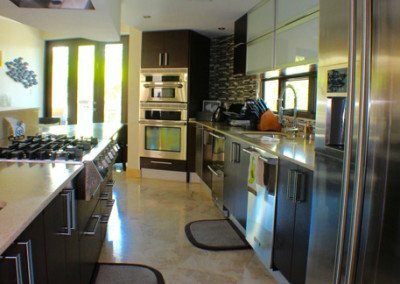 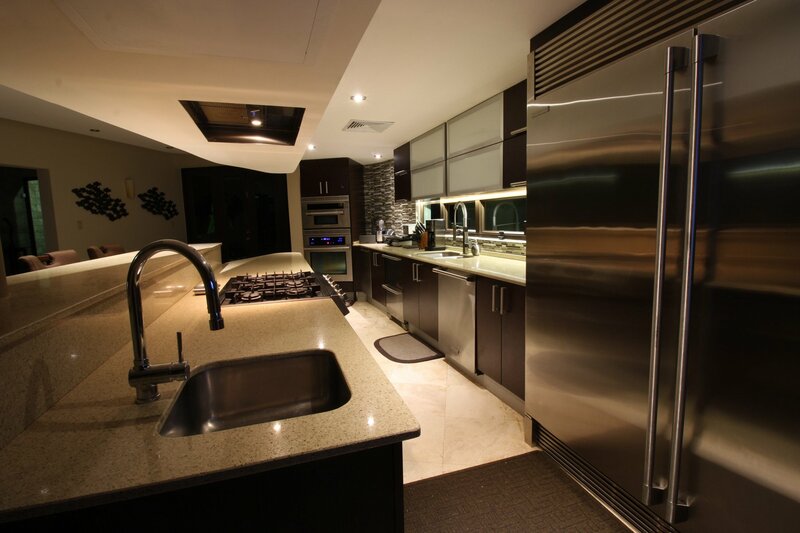 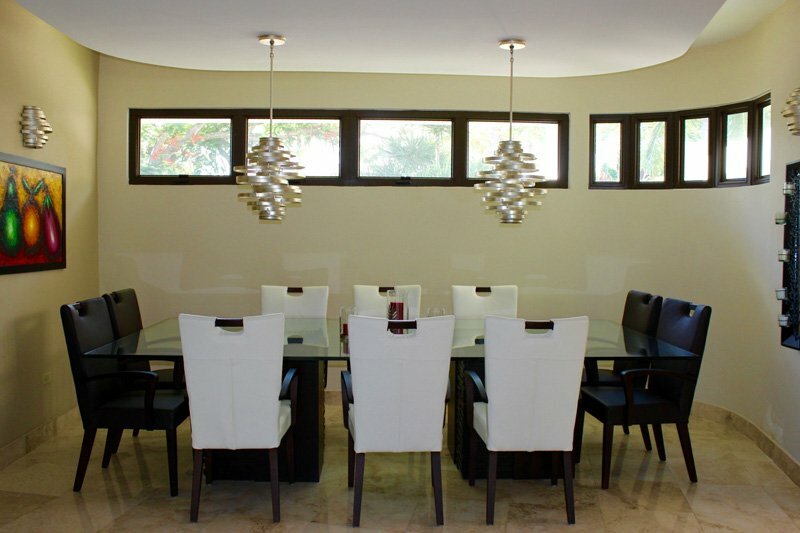 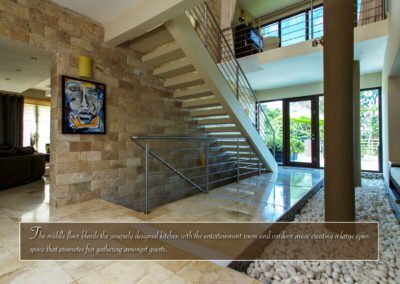 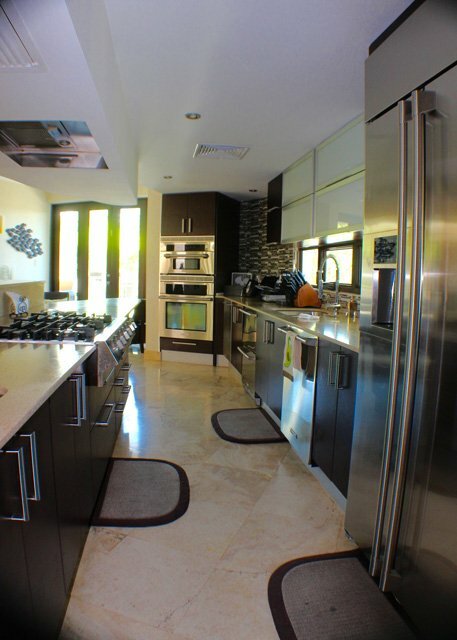 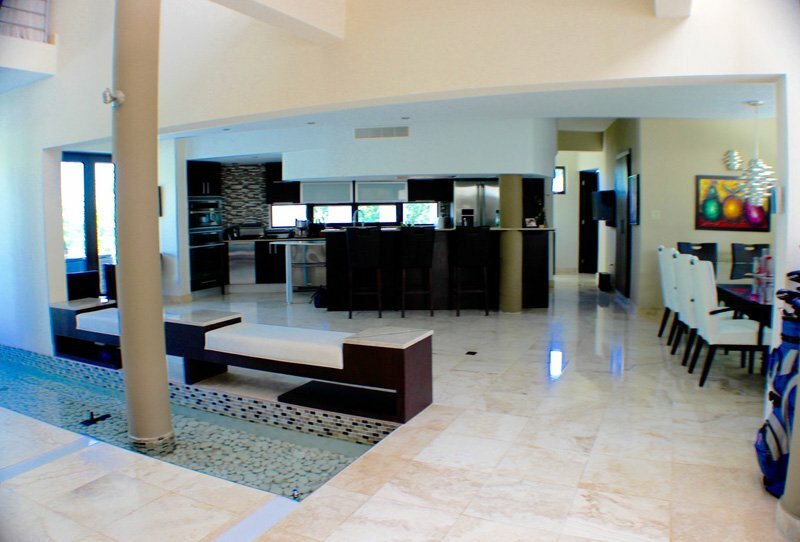 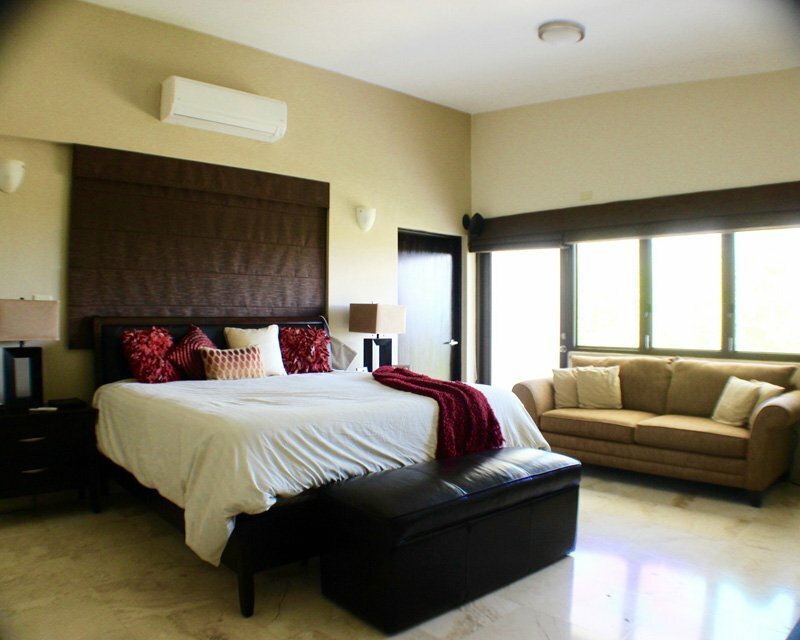 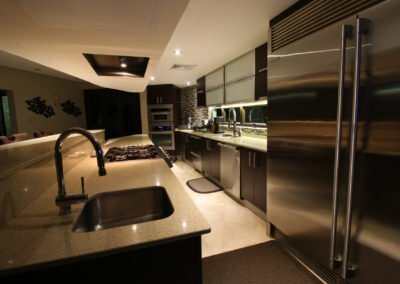 This floor features a bedroom with ensuite bathroom, a gourmet kitchen with top-of-the-line Stainless Steel appliances with quartz and granite counter tops (similar throughout the villa), A dining room table that seats 10 guests. 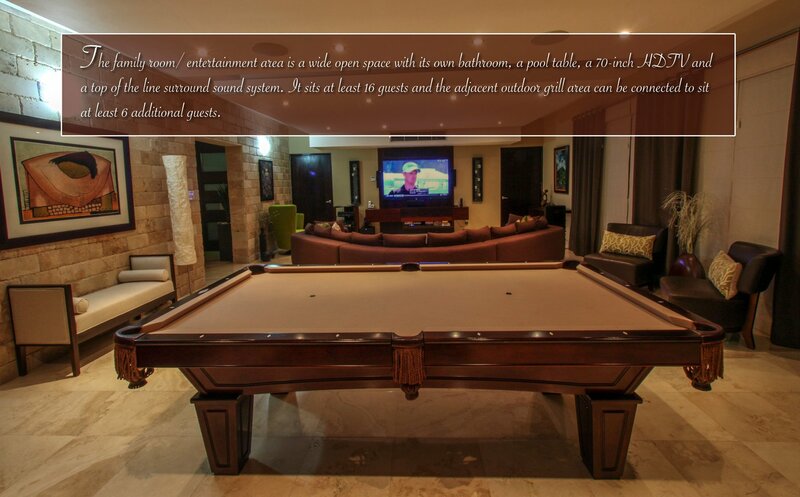 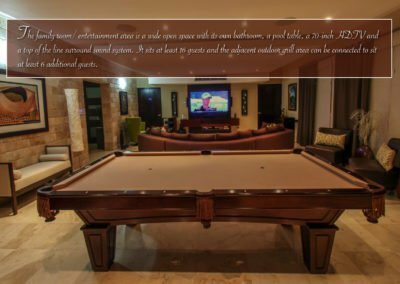 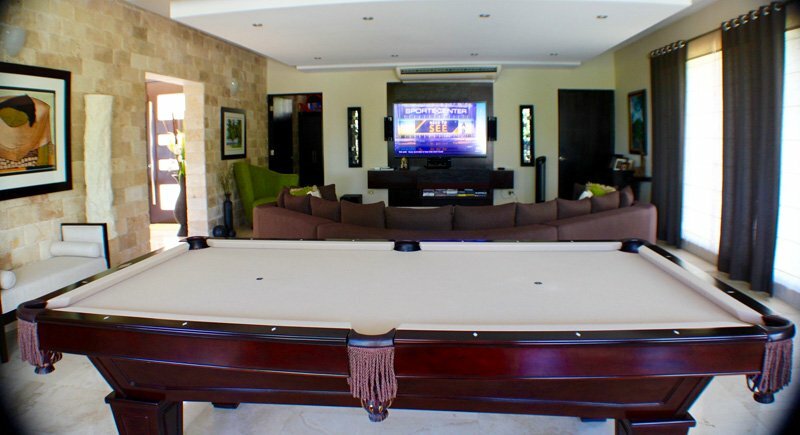 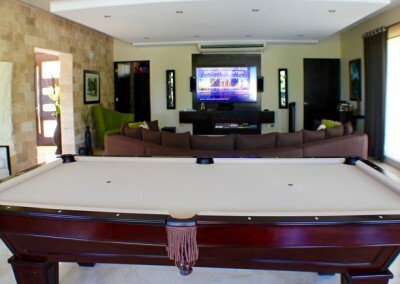 An entertainment area that includes a pool table, full-bar, 70-inch 3D TV and professional multi-zone surround sound system that can accommodate multiple music sources based on the zones. 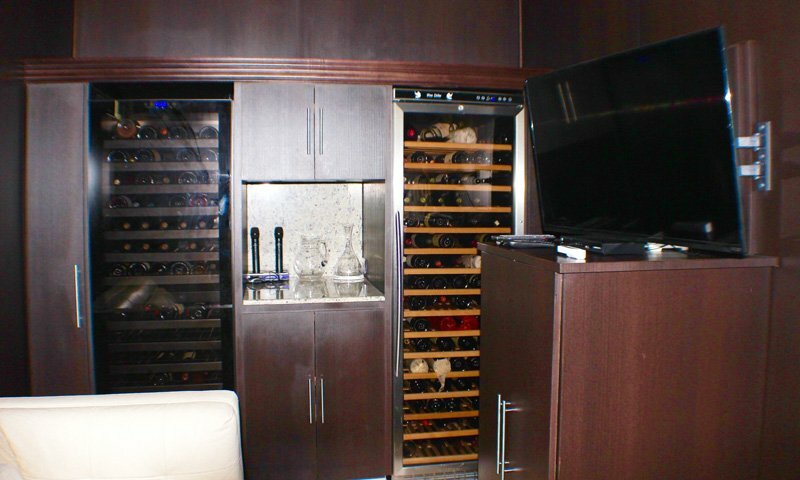 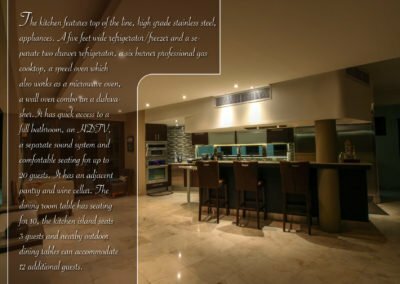 For the Wine Connoisseur’s in the group there is also a wine cellar with a wide selection of premium wines from around the world available. 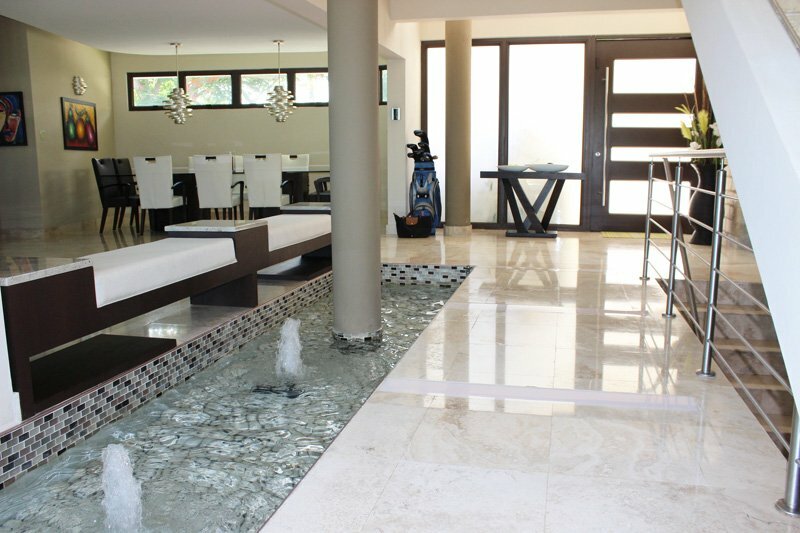 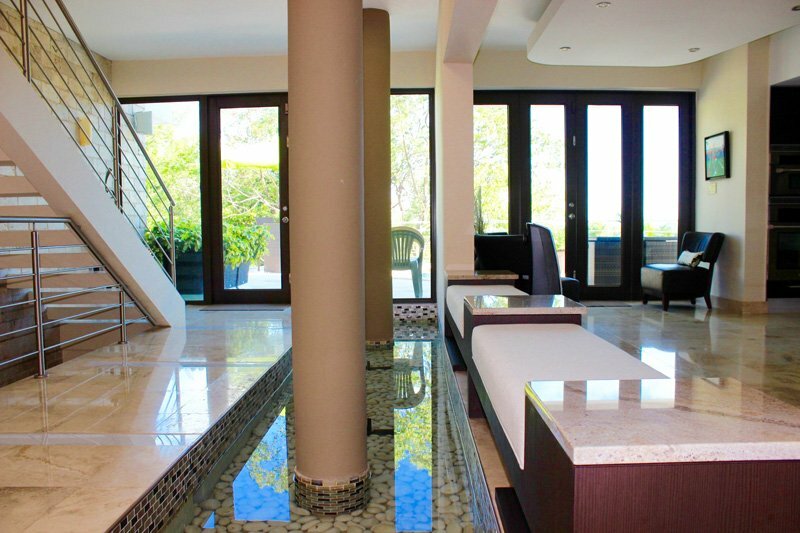 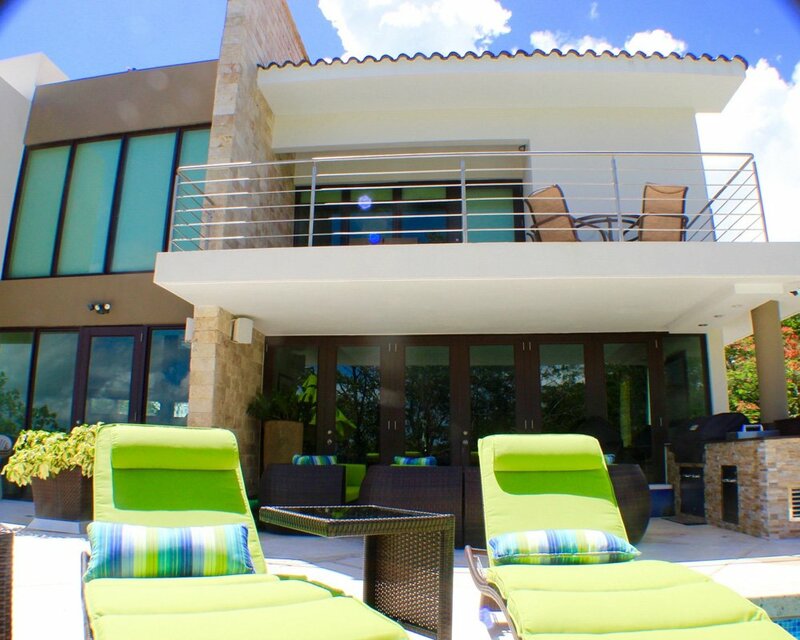 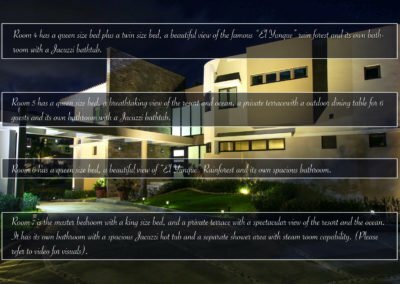 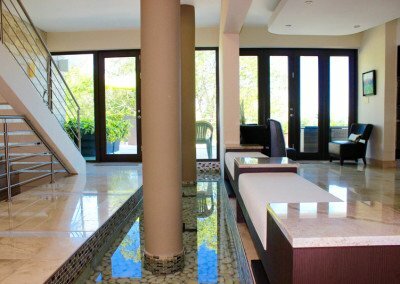 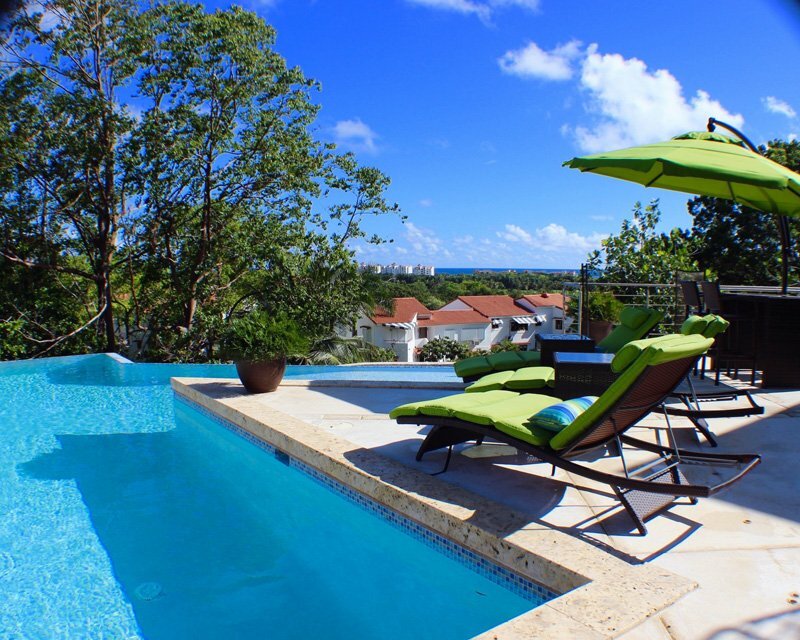 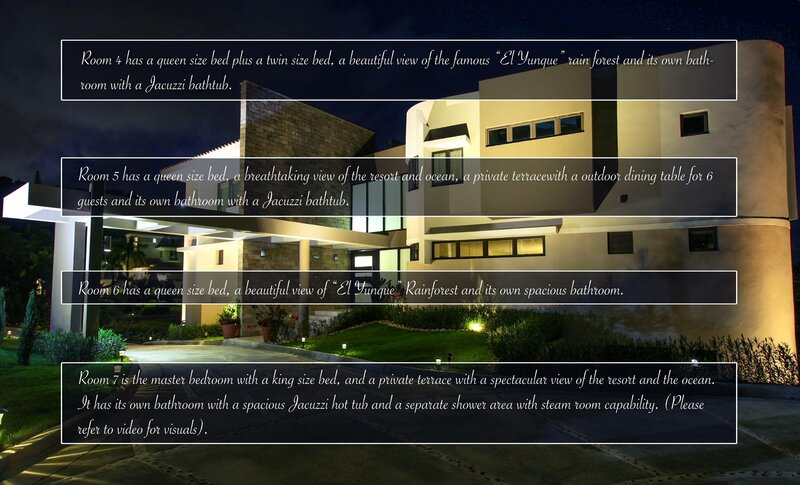 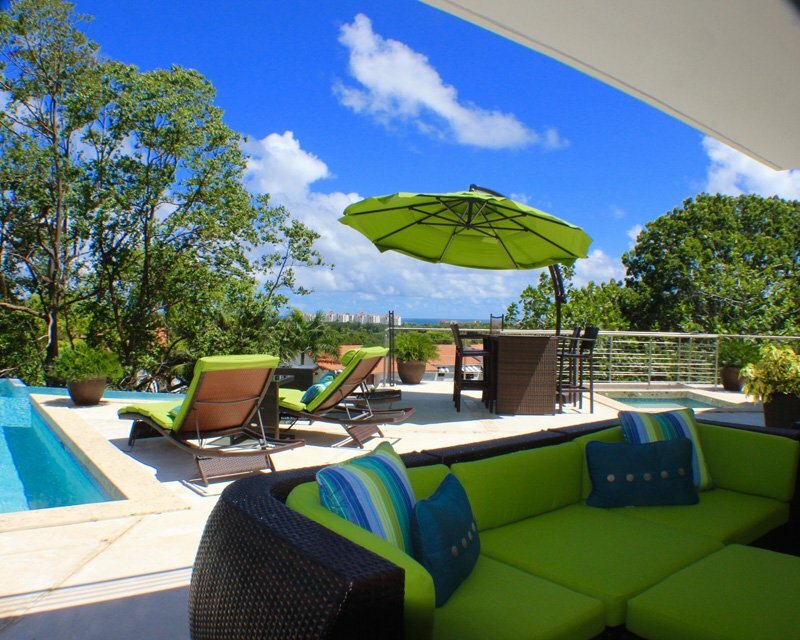 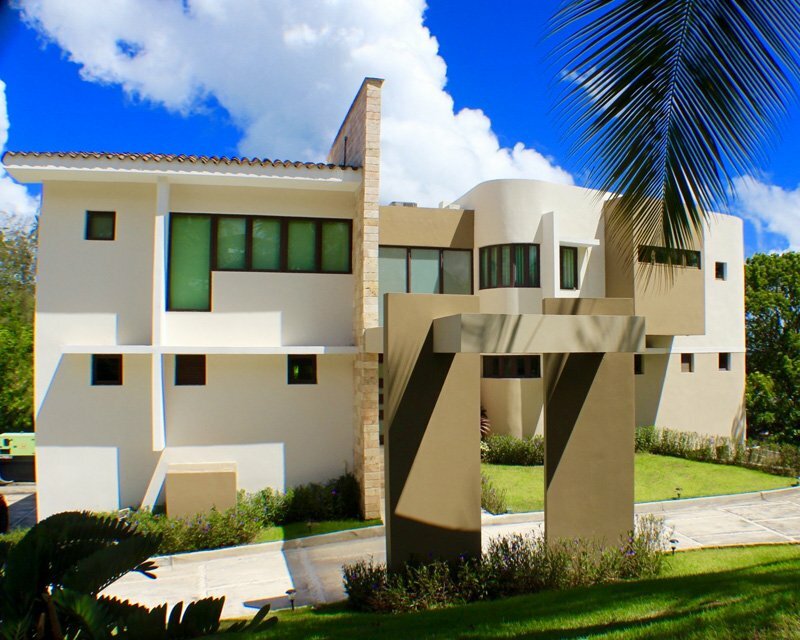 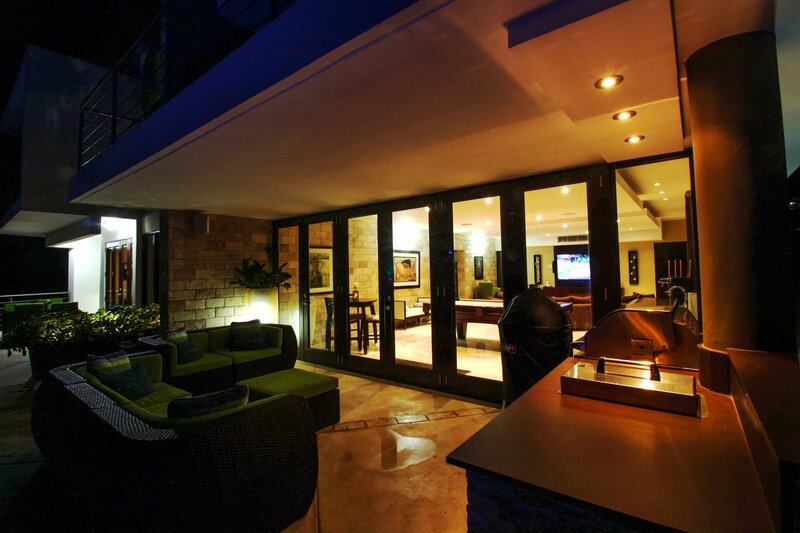 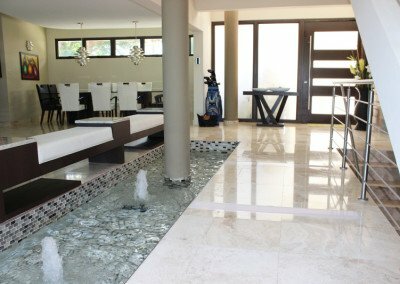 Enjoy the outside features of the Villa which include a sparkling Infiniti pool and jacuzzi that can be heated. 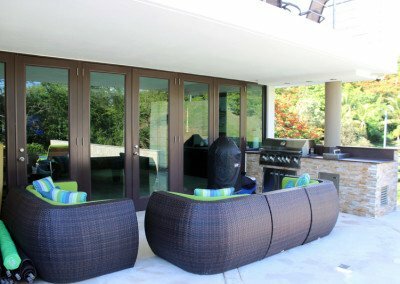 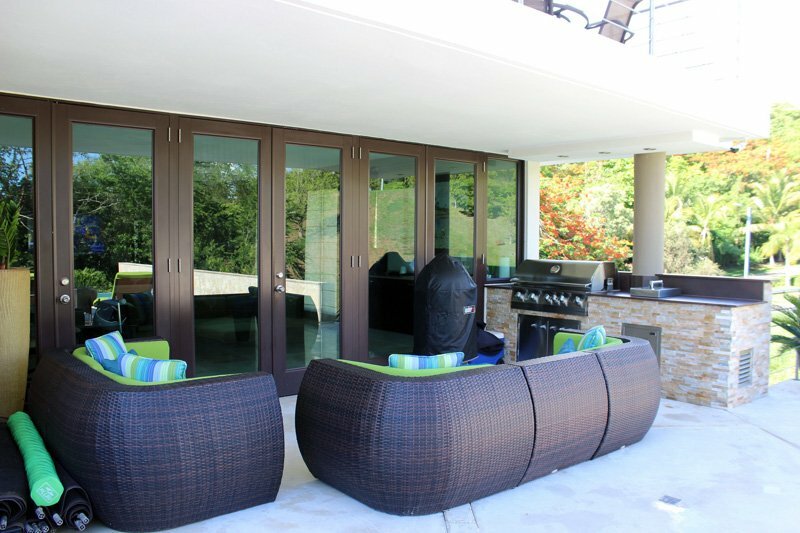 For those guests that enjoy barbecuing, there is the gourmet grill and smoker. 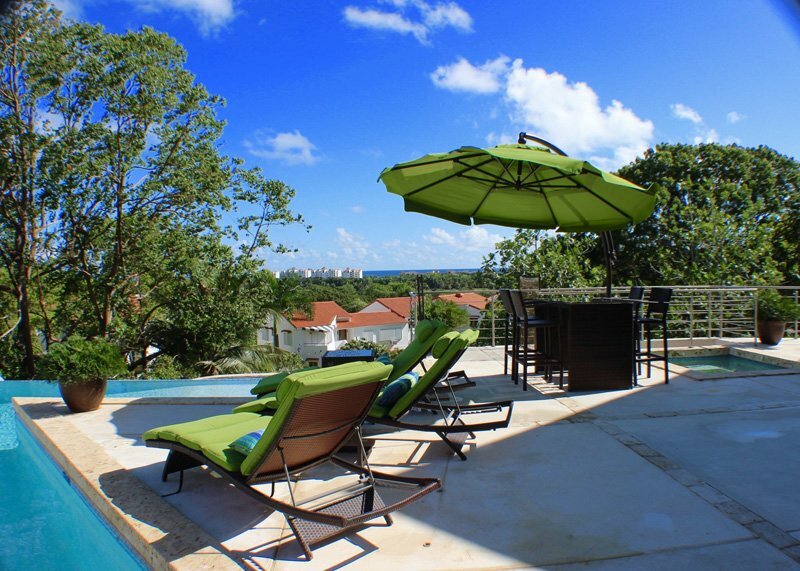 Guests can also lay on the pool lounge chairs while absorbing the views, breeze, and the amazing stars at night! 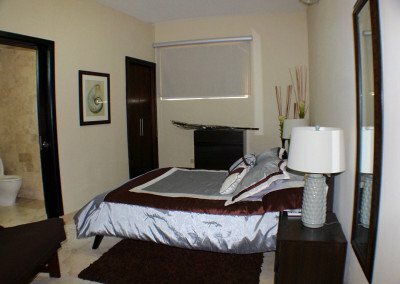 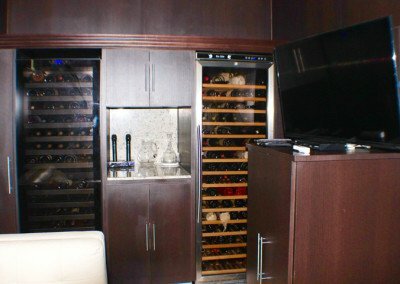 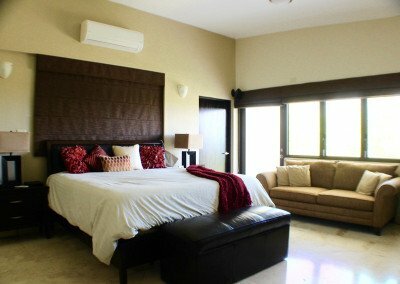 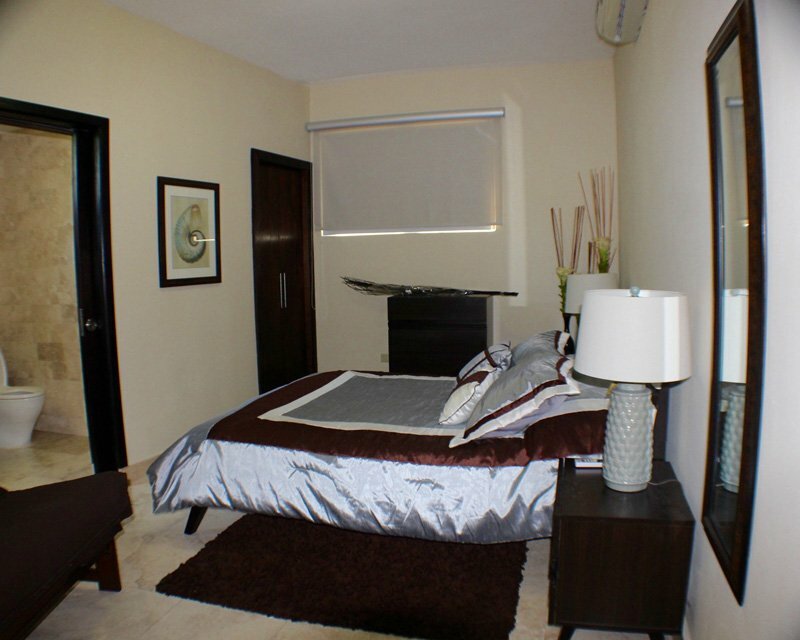 There is the garage, one bedroom with a queen bed and en-suite bathroom, and a gym room that has a queen-size sofa bed. 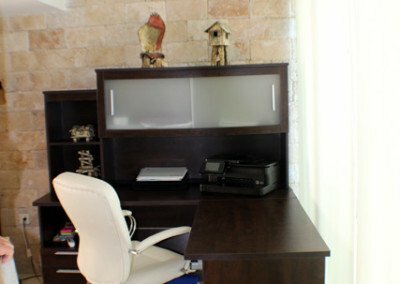 Wireless internet & Cable T.V. 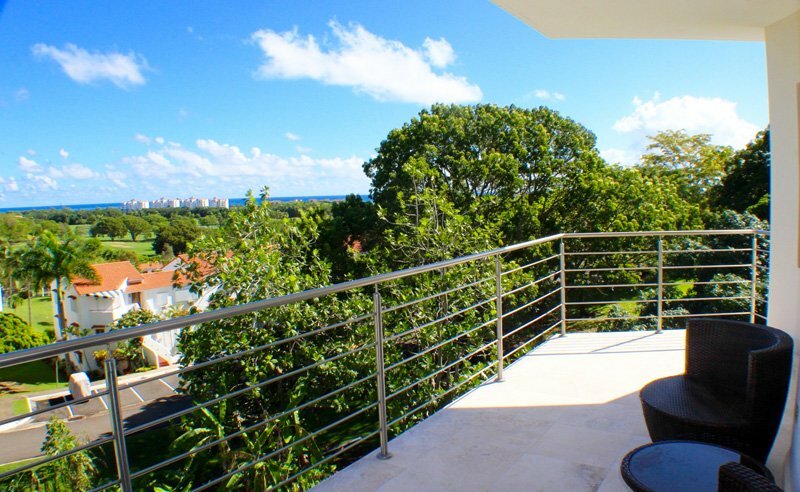 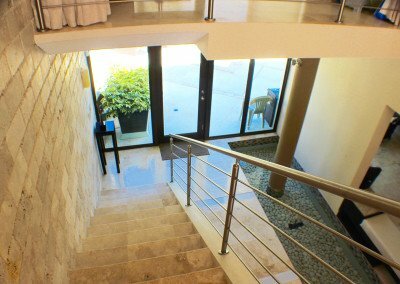 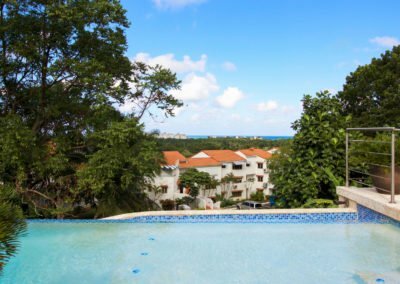 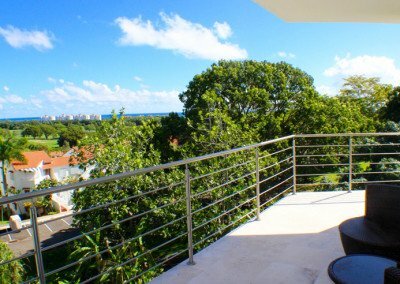 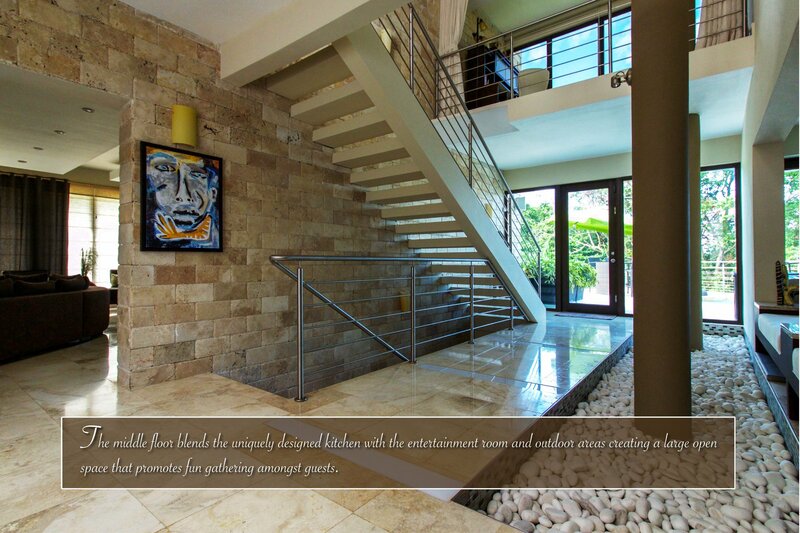 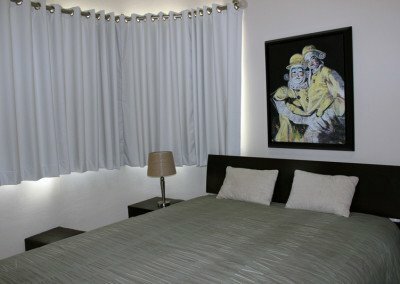 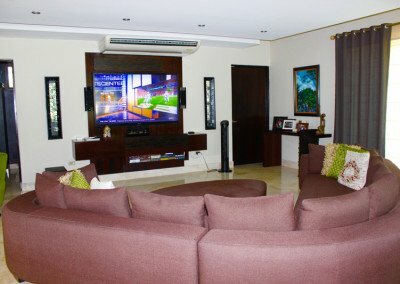 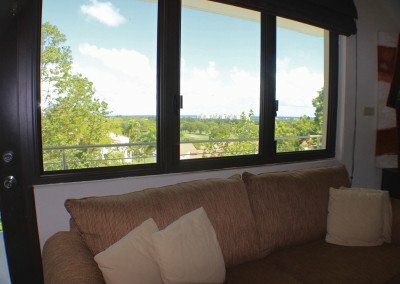 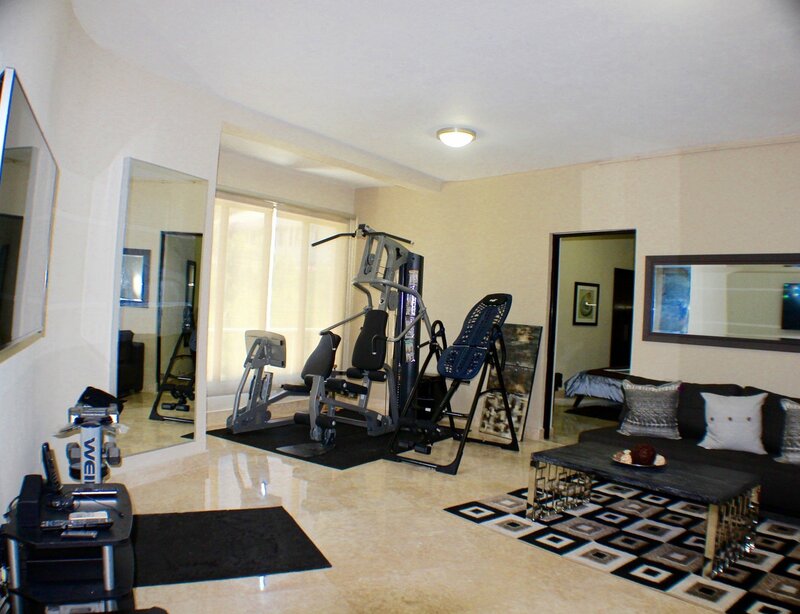 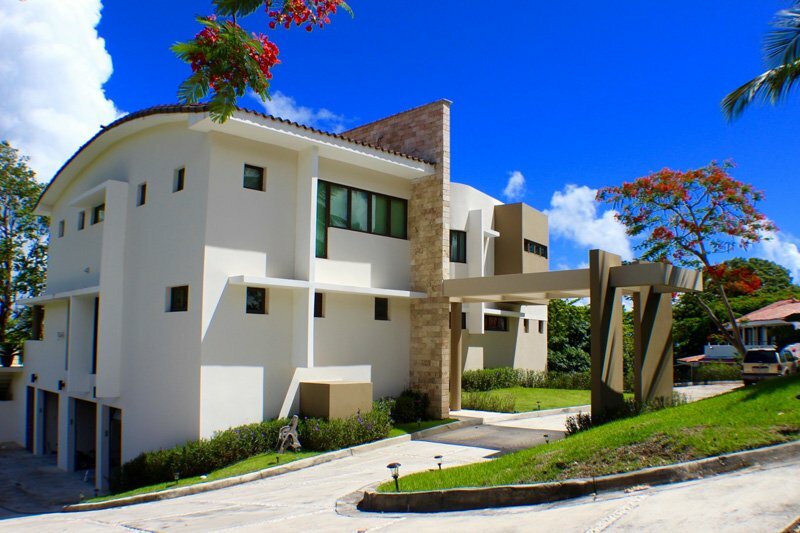 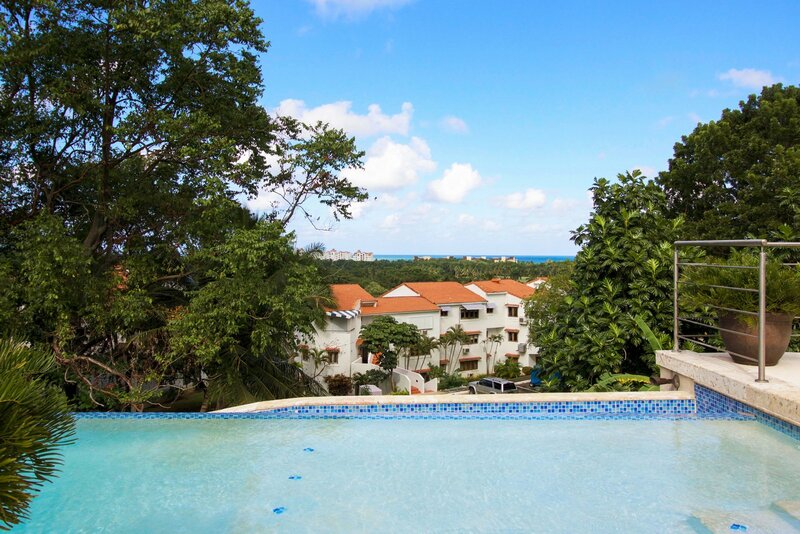 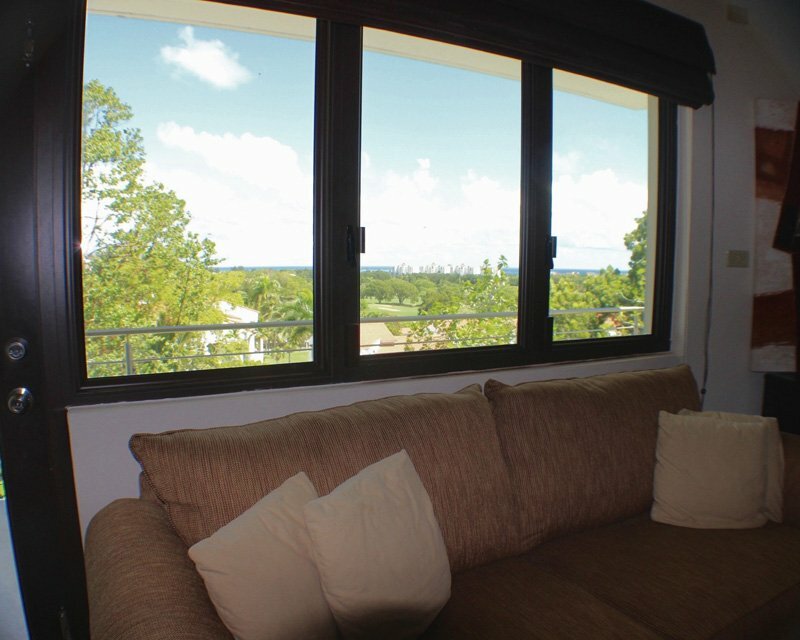 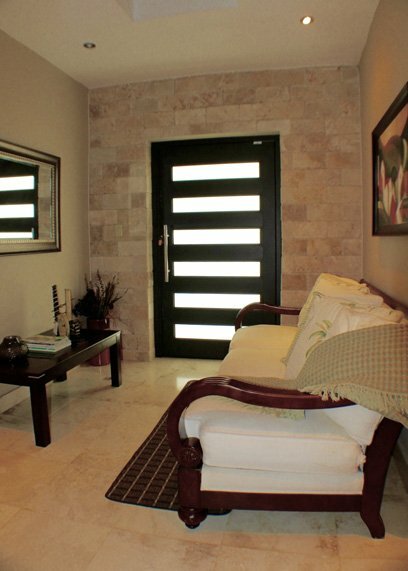 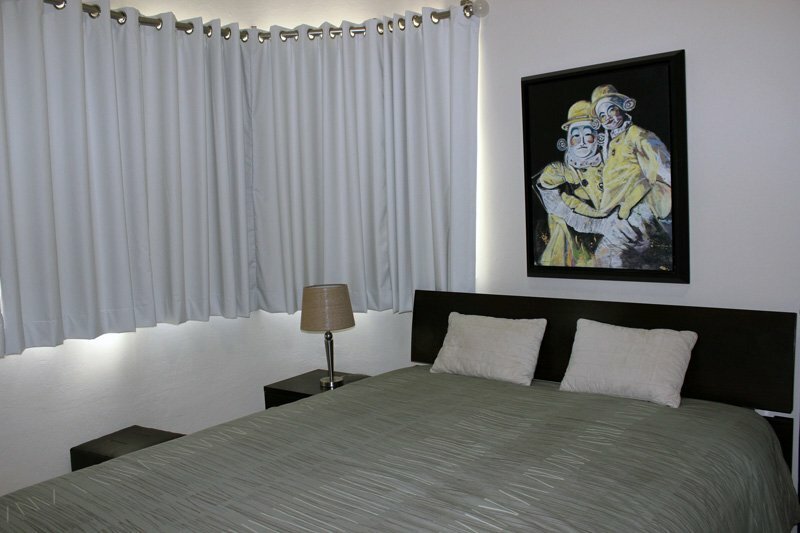 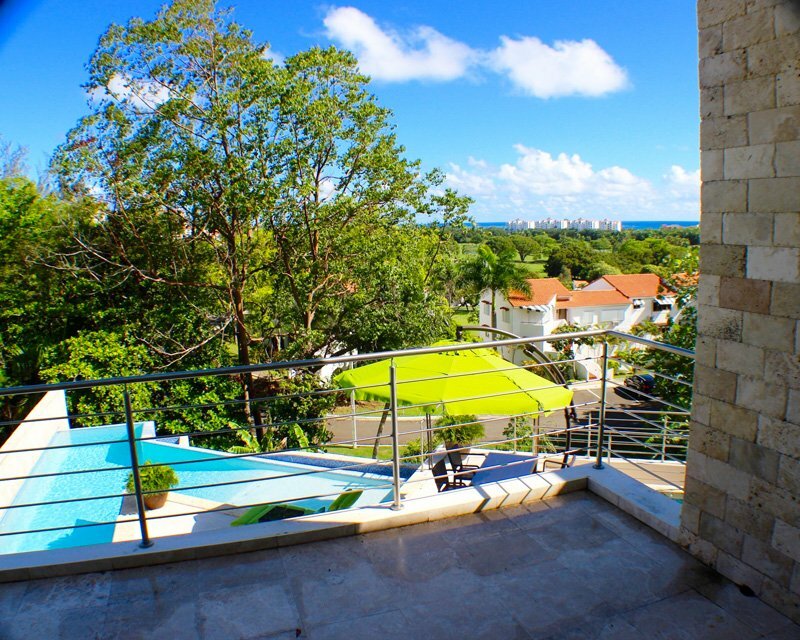 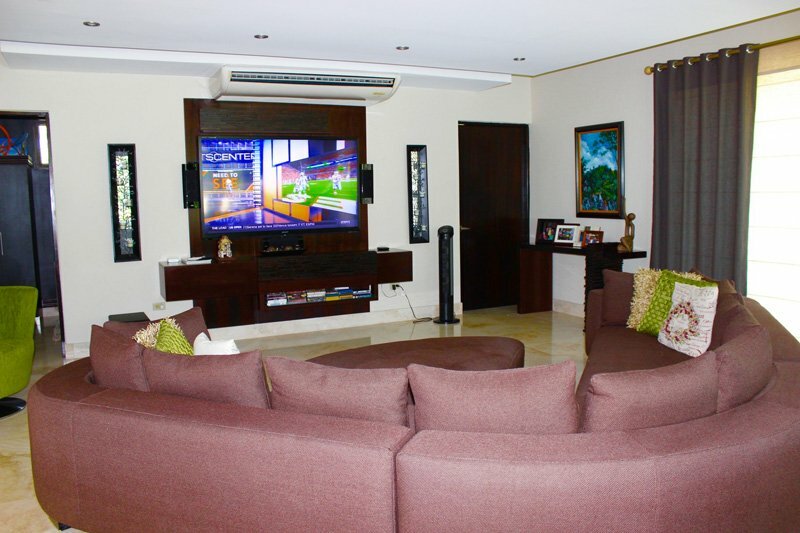 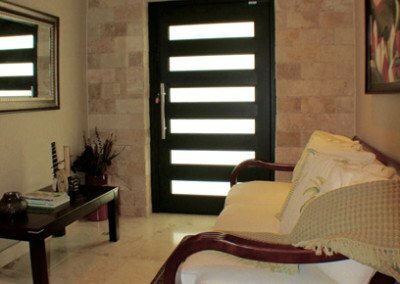 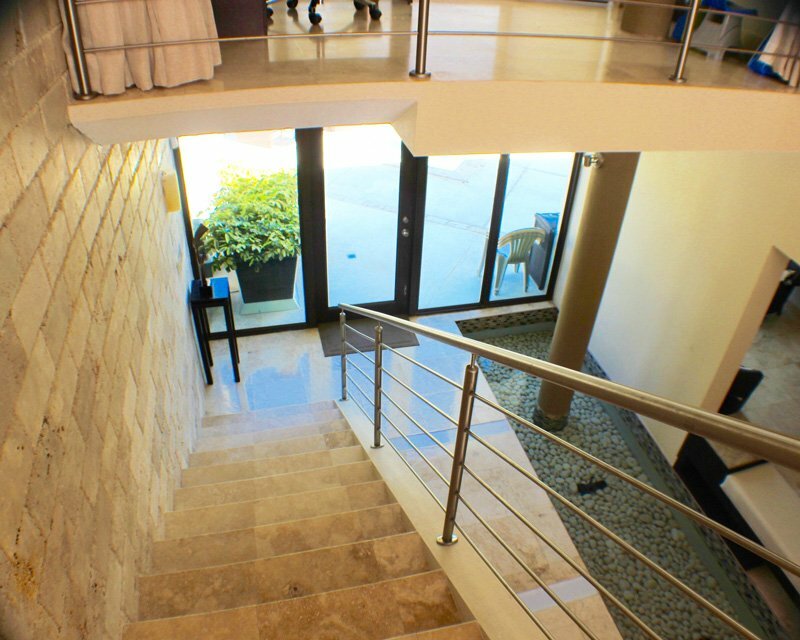 Access to Hotel facilities & Shutter service inside Rio Mar area.